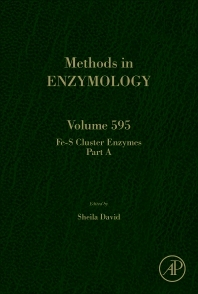 Experimental Analysis of Enzyme Mechanism Using Isotope Effects, Volume 596, the latest release in the Methods in Enzymology series, continues the legacy of this premier serial with quality chapters authored by leaders in the field. Chapters in this comprehensive update include Measurement of enzyme binding isotope effects, Chemical ligation and isotope labeling to locate dynamic effects, Measurement of heavy enzyme isotope effects, Extracting kinetic isotope effects from a global analysis of reaction progress curves, KIE of metabolic flux and enzymes, Solvent and Primary KIE on Flavin Enzymes, and The Rapid Determination of Primary Deuterium Isotope Effects on Enzyme-Catalyzed Proton Transfer at Carbon in 50/50 HOH/DOD. Readers who are interested in applying or understanding this research will find useful methods currently used for measuring isotope effects on solution and enzyme reactions. Enzymologists and biochemists interested in learning how to overcome the inherent challenges to measuring and interpreting kinetic isotope effects. Dr. Michael E. Harris received his BS in Chemistry from Florida State University in 1986. While an undergraduate at FSU he worked in the lab of Dr. William F. Marzluff on the cell cycle regulation of histone mRNA stability. In 1992 he began graduate school at the University of Alabama at Birmingham in the laboratory of Dr. Stephen L. Hadjuk. Dr. Harris’s thesis project involved investigating the mechanism of U-insertional RNA editing in trypanosomes. Building on his emerging interest in RNA structure and function he pursued postdoctoral training at Indiana University with Dr. Norman Pace. While in the Pace Lab, Dr. Harris used crosslinking and molecular modeling to generate the first accurate model of the ribonuclease P ribozyme. Since starting his independent research lab career at Case Western Reserve University in 1996 the Harris Lab has been involved in a long term investigation of catalysis and molecular recognition of RNA processing enzymes. A central component of his research involves using tandem mass spectrometric methods developed in collaboration with Dr. Vernon Anderson for measuring kinetic isotope effects on RNA 2’-O-transphosphorylation reactions. In addition, the Harris Lab has pioneered the development of new high throughput methods for measuring RNA binding affinity and processing rates. His lab is using these novel approaches to investigate the basic principles that define the specificity of RNA binding proteins and RNA processing enzymes.